Using energy from the sun, nature's carbon cycle goes around, from the atmosphere to the forest and back. Here is how it works. Trees absorb carbon dioxide from the air as they grow. In fact, about half their dry weight is this absorbed carbon. As old trees die and decay, or are consumed in a forest fire, their carbon is again released to the air as carbon dioxide. 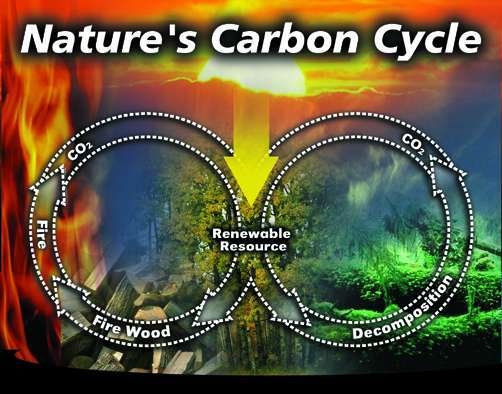 This is nature's carbon cycle. The other fuel options — oil, gas and coal — are fossil fuels, and when they are burned, old carbon that was buried deep within the earth is released to the atmosphere. The rising concentration of carbon dioxide from fossil fuel use is linked to global warming, climate change and the unusual weather we've seen in recent years. appear here courtesy of ICC/RSF.